A few months ago, while working on a series of stories about individuality, duality, and self-expression amongst urban youth, we came across the incredible story of Sofia Ashraf. 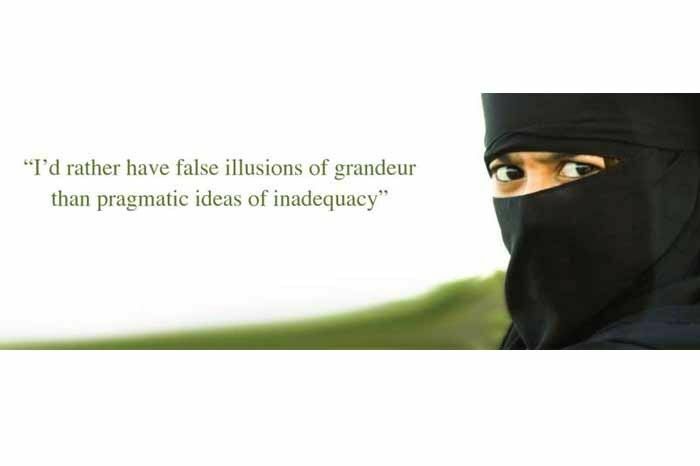 By then, she’d already broken free of some serious societal shackles, challenged stereotypes and railed against anyone who told her she couldn’t be exactly who she wanted to be--including herself--both as the infamous ‘Burkha Rapper’ and as an ordinary individual. She was kind enough to pen a first-person narrative of her journey for us and all we can say is, it’s well worth your time. “I live my life in a state of constant duality. Between fervent ambition and numbing nihilism. Between professionalism and ideology. Between Mumbai and Chennai. Call me fickle, call me confused. But being in limbo doesn’t paralyse me. My duality drives me to seek answers and explore sides of me that a well-adjusted me might never chance upon. All dualities aren’t constant though. Take for instance the oscillating pendulum between my blind faith in God and my strongly atheistic pragmatism. Spoiler alert: I chose the latter. The journey though, is a long story and every story has at least two sides to it. Both versions in this case are mine. Once upon a time, I was born into a rich, happy, carefree Muslim household in Chennai. Once upon a time, I was fettered and bound, unable to express myself truly. I was strongly religious. I loved my religion and all it entailed. It was beautiful, it defined me and it gave me purpose. I was always confused though. Religion told me one thing, my brain told me another. My heart? Well my brain told me it’s just an organ that pumps blood and religion agreed. I was a bit of a groupie too. I wore the merch. I knew all the words to the prayers. I was constantly talking about it. I loved to dance too. And dance I did. Between four walls and five times prayers. On stage at my all-girls’ school with my all-girls’ team surrounded by all-girls’ cheers. But what decadence, I wanted a bigger audience! My mother though, loved to sing. She was always training my sister to sing. My sister who had the voice of sunshine reflecting off honey. My sister who was bullied in school. My sister who needed a little extra push to overcome her chronic introversion. Maybe if I learned to sing, we could all be a family. We had nothing else in common. But melodies eluded me. Rebellious notes kept jumping away from the neat tune I laid out in my head. I had to accept it, I couldn’t sing. But I could still…music. In my attempt to impress my mother, I discovered my love for music. So what if I couldn’t sing or play the piano. I had music inside me. But how do I tell them I did? I tried. It came out as musical prose. Luckily there was a name for it back then—Rap. Elders in my religion said it was wrong but music felt right too. There is melody in prayers and piety in the sound of violins. Why couldn’t I rap praises to God’s name or dance in exultation at his creation? Then 9-11 happened. I could see people treading on eggshells around me. I felt the need to defend my religion. I started a Muslim Youth Group. But I wanted the message to reach more people. Then came along the perfect opportunity – Justice Rocks. A subversive rock show that lobbied for social and environmental issues. A platform where I could state my case to an audience who came to listen as much as they came to mosh. I owe the entire series of life changing events that followed to the organisers of this show. At Justice Rocks I rapped about Islam. I also rapped about environmental issues. I think there was also a tongue-in-cheek piece about language politics. But what stuck wasn’t just the message. It was the image. The sight of a woman in a burkha, rapping. The press lapped it up. The live video started getting a couple of views. And the greatest honour of all – A.R. Frikking Rahman called me and asked me to rap for him. If you didn’t get goosebumps reading that line, no amount of carefully crafted adjectives can make you fathom the sheer ecstasy that meeting gave me! The press coined me the ‘Burkha Rapper’. How embarrassing! It wasn’t meant to be a gimmick. It wasn’t a costume or a statement. It was as much my identity as my personality. I will never take it off, I said. And then the veil fell. From my eyes and from my body. It wasn’t an epiphany. There was no radiating light guiding me or musical crescendo leading me to my destiny. It was a slow decay of an old belief that no longer made sense to me. So I gave it up. I was a blow to people around me. My mother the most. People had always told her I was different. That I would rebel. But she defended me. “Just you see,” she would tell them “she’ll prove you all wrong.” Sorry ma! I proved the others right. The toughest part about following your heart is the trail of broken ones you leave behind. Standing up to society doesn’t mean picket fences and tear gas. My Tiananmen Square was hearing my grandmother plead, with tears in her eyes, for me to accept Islam again while I refused to give in. My hunger strike was seeing the pride my family had in me slowly drain away. My hemlock was willfully accepting that my mother could never truly accept the person I have become. But I am too brutally honest to lie to myself. I did it for 22 years and I couldn’t do it anymore. With the end of one duality, began another. Thus far, a book told me what was right or wrong. But now that I had to decide for myself, I didn’t know. What did I believe was right? What were my principles? Was I a good person or a bad person? I couldn’t find these answers at home. It was too familiar. Too easy to slip back. I moved to Mumbai to find myself. 4 years in the city. 4 glorious years of rising and falling. Disappointments and personal victories. I still haven’t found my answers. But this quest has led me to so many new discoveries and new questions. It led me to so many new experiences. I traveled far and tasted new flavours. I fell in love and out of it and found the will to fall in love again. I danced in the rain and nursed myself out of the fever that followed. I cried on shoulders, sometimes others’, sometimes my own. I met people. So many people. I danced with sinners and sung with saints and found their tunes to be the same. I am not the same girl who left home 4 years ago and yet I am still her. That girl was rebelling against pop culture by wearing her convictions on her sleeve. This girl has a whole new revolution to sustain. That girl couldn’t experiment with her clothes, so she expressed herself through her hair. This girl still loves to take scissors and colours to her hair. I mean, I went bald for heaven’s sake. If haircuts are therapy, that right there is rehab! That girl may not relate to this one nor vice versa. But I think the two can respect each other. They both believed in something. [Written by Sofia Ashraf. Sofia Ashraf is a 28-year-old copywriter by profession and a rapper by digression. A workaholic from Mumbai, from Chennai, from Kannur, from everywhere yet nowhere. After nearly two years of dappling in professions ranging from dubbing for anime to music, theatre, dance, event management, video editing, and graphic design she has currently settled down as a copywriter at Ogilvy & Mather Mumbai.